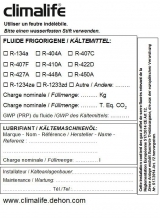 The installation labels were produced to comply with the European Regulation N°1494/2007 concerning the labelling of refrigeration installations containing more than 2 kg of refrigerant. This label will show the type of refrigerant and the installation refrigerant charge in kg as well as the lubricant type and its quantity. 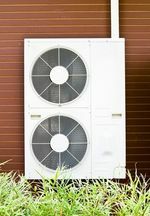 This information enables an easy maintenance of the installation. A space is dedicated for the installer to enter his company name as well as a telephone number. One part for the information. At the back of the label a very powerful glue. Second part, a transparent film (with specific anti UV treatment) that covers the first part and guarantees that the information will not be modified or erased. It is recommended to use an indelible felt.